The BlackBerry PlayBook samples being handed out to developers at the BlackBerry DevCon in Amsterdam this week come with the option of a beta version of PlayBook OS 2.0. But that's just for the technical features in the operating system like running Android applications, not the new Cascades-based user interface or the new messaging apps. Images of those are plastered around the conference centre and we saw a demo of the same new features RIM talked about at CES 2012, along with sample apps and tools to help developers create great-looking apps that fit in with the new BlackBerry style. New CEO Thorsten Heins claims that "we've taken our strength in messaging and collaboration and brought that together for a seamless experience in PlayBook OS 2.0, giving a users a truly social, intuitive, fun and easy way to connect with their world". What do you get in the update to deliver that? Email, calendar, contacts and remote control – but not BBM, which RIM says isn't ready yet (expect to see that later this year). The best BlackBerry apps have always integrated into the built-in BlackBerry tools like messaging and calendar. The new PlayBook apps come with some key services already integrated in a way that lets you move from an email message that renders as beautifully as a Web page to the details of the sender to their Twitter feed and Facebook updates to the latest news about the company they work for to places you've met them in to a list of people you both know (courtesy of LinkedIn), without having to jump out to another application and look them up all over again. It doesn't work quite the same way as the social integration in Windows Phone but the underlying principle is similar; make it easy to get at the different ways you can interact with someone. This is what RIM is calling BlackBerry 'flow'; the key, says Heins, "is to be effortless in terms of everything you do". In email the features are based on the Gist social network integration technology that RIM bought; the calendar uses the scheduling and sharing tools it got from Tungle. But one of the best features in the calendar is the simplest; days when you have lots of meetings use a larger font in month view so you can see straight away when you're going to be busy. PlayBook OS 2.0 isn't just the new apps; head of software head of software Vivek Bhardwaj calls it "a complete overhaul; we've enhanced just about every application". Mostly those are small changes but the Web browser gets a major upgrade in 2.0. Heins claims that PlayBook and BlackBerry 10 will have "the most comprehensive mobile support for HTML5 of any platform". That maters not just to make Web pages work the way you're used to on the desktop, but because that's a way developers can create apps that run on BlackBerry today, PlayBook this month and BlackBerry 10 at the end of the year - and RIM lets HTML apps use native BlackBerry features like integration with BBM. The browser has and will continue to have Flash support (Adobe will give RIM the code to keep updating it themselves if necessary). It also supports AIR 3.0, which lets developers create apps that don't look like Flash; Documents To Go on the PlayBook is an AIR app that hooks into native PlayBook functionality so it feels like a native app. The PIM applications in PlayBook 2.0 have an interface using the 3D animations and transitions designed by RIM's new user experience team, the design consultancy TAT. They're hardware-accelerated to be smooth and speedy and the signature style is something RIM design head Jeff LeJune is calling "pre-packaged elegance ". That could give you the look of physical paper with curling edges or photos that shrink and zoom like vector graphics. Zoom out on a list of notes or messages and they don't just get smaller; the list folds like a concertina and just displays items that are flagged or highlighted - again, an idea a little like semantic zoom in Windows 8. RIM is doing some interesting things with the Cascades styles; it's also making them available to developers to use in their own apps, so we're expecting a range of apps with the new PlayBook look. Now that PlayBook has its own PIM tools, you don't need BlackBerry Bridge just to read and send email. You can still use it to get online if there's no Wi-Fi to use, but Bridge till also turn a BlackBerry into a remote control for the PlayBook. The most obvious use is for typing on the still-superior BlackBerry keyboard rather than on the on-screen PlayBook keyboard. 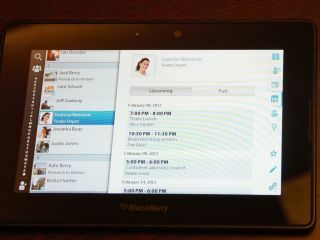 But as long as it's a touchscreen BlackBerry you can also use the same swipe gestures on screen to control PlayBook apps. Imagine plugging a PlayBook into your surround-sound TV or hi-fi using the HDMI socket; that's a bit unwieldy to keep in your lap, but you don't want to get up and walk over to the tablet every time you want to change the station in Nobex Radio or pause the video you're playing. Using a BlackBerry as a remote control that lets you make the same gestures you'd use on the PlayBook could be appealing for that, and for gaming. You wouldn't want to play Cut The Rope on your TV by controlling the screen from a BlackBerry, but it would work for more immersive games. BlackBerry OS chief Chris Smith claimed in his keynote that "we have console-quality games on a tablet". At work, you could put the PlayBook on your desk in a stand that displays the screen well and control it without leaning forward and hunching over uncomfortably. What does QNX mean for PlayBook and BlackBerry 10? Think BlackBerry has been falling behind (despite sales in Europe that have actually grown 75% year on year)? RIM's actually been thinking about that for the last three years, which is when Heins points out the company "began assembling the pieces we needed to build a future proof next generation platform that will take us into the next decade" (buying the many companies that bring new features to PlayBook). The plan is to keep the best of both worlds. "We've taken the best of BlackBerry on the device with superapps and the BBM social platform, and in the cloud and we've married it to an industry proven powerhouse OS that powers 25 million vehicles, that runs in Internet routers, in medical devices and in nuclear plants." One advantage of QNX is what Heins calls a "next-generation content and communications flow not just between apps on the same device but between devices; a seamless experience that will be used in cars, in the home and in even more vertical segments to come". QNX looks at the system it's running on very differently from other operating systems. When it connects to other QNX systems, as long as it has the right permissions it treats their resources as if they're part of your system - so a photo stored on another QNX system shows up alongside the photos on your device. That means a QNX system in a car could have the list of addresses or the music files from your PlayBook without you having to sync it. In PlayBook OS 2.0 the Open To feature will let you take a picture on your BlackBerry and display it immediately on your PlayBook. Expect to see more apps using this to let you move content seamlessly between BlackBerry and PlayBook - how about taking a Web page you want to see in more detail and pushing that onto the bigger PlayBook screen with a gesture? PlayBook OS 2.0 release date: when is it? The official RIM line is still "this month" but "we're not giving the date yet" (and BlackBerry 10 is still "later this year"). There have been plenty of rumours about specific dates (especially since RIM posted an image of the new interface for AppWorld showing February 16th as the date) and adverts for the upgrade have been appearing in some UK phone stores this week suggesting it's imminent. We also expect PlayBook OS 2.0 to come out before Mobile World Congress so the announcement doesn't get lost in the crowd of other phone news. RIM would also do better to avoid launching at the same time as the Windows 8 Consumer Preview but until Microsoft announces a date that's hard to ensure. From what we've seen of the latest builds, we're not expecting any delays and the firmest indication came from Vivek Bhardwaj who said "We're a matter of a couple of week away - we're at the point of eyeing out the last few bugs". RIM has been making the technical improvements in the PlayBook available to developers for some months. So we expect it to launch with both a large number of converted Android applications (which work properly with PlayBook gestures like opening app menus) and applications that take advantage of what PlayBook OS 2.0 can do like 3D gestures in AIR that let you control an application by waving your hand at the camera. Having lots of PlayBook apps matters, but apps that show what QNX can really do are going to be what makes PlayBook stand out from the tablet crowd.